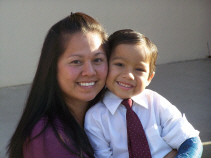 11/15/2010 - Gabriel Has Completed all Treatment. 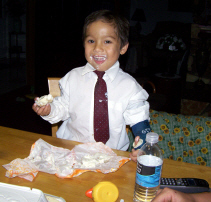 On July 12th, 2010 Gabriel has complete all of his teatment for Leukemia and has been pronounced in remission. We met with the doctor today who will be removing his Medi-Port from his chest on December 21st just in time for Christmas. This is truly an amazing Christmas gift for us all. Please continue to Keep Gabriel in your prayers and know that you are all in our family prayers too. God bless you and thank you for all your prayers and support. "Whenever my enemy provokes me to combat, I try to behave like a soldier." 06/21/2009 - Gabriel Continues to Do Well. Last month (May 1) was Gabriel's 2 year mark since he was diagnosed with leukemia. Hopefully the next 14 months will go by as fast as the past 24. Gabriel is now 5 years old, soon to be 6 in August. Although he has not grown much physically, he has sure grown mentally, emotionally and spiritually. I think we could all learn a few lessons from him. He has taught us so much about trust and faith. We can truly understand what Jesus meant when he said, unless you become like children, you will not enter the kingdom of heaven. Gabriel's faith, strength and purity of heart gives us all pause on a daily basis. It has been some time since my last update so I will try and bring you up to date. 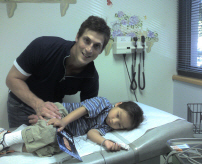 This past December, a young NHL Hockey player named Vinny Lecavalier came to visit the children at All Children's hospital during Gabriel's chemo treatment and spinal tap. (Un-known to us, Vinny donated 3 million dollars to form The Vinny Lecavalier Pediatric Cancer and Blood Disorder Center at All Children's Hospital, the Center handling Gabriel's treatment). The doctor came into Gabriel's treatment room and told us that Vinny would like to watch Gabriel's spinal tap procedure and asked us if it would be ok? Vinny didn't want to just donate money, he wanted to be part of the entire picture including meeting the children and their families and seeing first hand what goes on. Vinny came in and joined us as the doctors began Gabriel's spinal tap and chemo treatment. I must say, he was one of the nicest, sincerest and most honorable young men I have ever met. He truly cares and wants to help the children and their families. He went on to talk to Gabriel and then gave him 2 autographed photos in his Tampa Bay Lightning uniform on the ice. After Gabriel's treatment, he told his older brothers that Vinny came to see him and they were absolutely stunned. Little did we know just how famous a hockey player Vinny is. We saw a young man who loves children and would use everything in his power to try and give these children a chance at life. You can see Vinny and the news conference covering his work with All Children's Hospital by clicking here. Thank you Vinny for your kindness, generosity and love for these children struggling for life. And thank you for touching Gabriel's life that day. This past January we were once again blessed by the generosity of Chris Rossbach and the Monster Jam family. Gabriel and family spent the day at Raymond James stadium in Tampa Florida for the Monster Jam pit party and the evening races and free style show. It was truly amazing and Gabriel had an absolutely amazing time. His collection of Monster Jam Trucks and games continues to grow as does his interest in the drivers behind the wheels of these amazing trucks. One of the first things Gabriel wanted to do was to give Chris a plaque we had made for him of Gabriel and Chris from the last Monster Jam in Orlando FL in 2008. Being a year older now at 5 1/2, Gabriel was not as shy as he was last year. He was interested in meeting the drivers and talking with the people he met. He even wanted to drive one of the radio controlled Monster Trucks that were racing in the pit party. After giving Chris his plaque, Gabriel wanted to meet the driver of the Monster truck named Bulldozer. So Chris Rossbach took him over to the truck and introduced Gabriel to "Chuck", the driver of Bulldozer. I can't say enough about these men and women involved in the Monster Jam organization. They bring great joy to the children of all ages including us big kids. They are truly genuine people and go out of their way to be as personal with each and every one they meet. Chuck would go on to talk to Gabriel and autograph his 2009 Monster Jam T-Shirt that Chris had given to him earlier. After meeting "Chuck", the driver of the Monster truck Bulldozer, Gabriel had a new hero that he would cheer for as the races began later in the evening. Each time Bulldozer would enter the track, no matter who he was racing against, Gabriel would stand up and yell "Go Chuck!". It was truly a moment in time that will remain in our memories for many years to come. While driving home that night, I turned around and asked Gabriel who the drivers were of some of the trucks. He started naming them off; Dennis Anderson in Grave Digger, Adam Anderson in TAZ, Lindsey Wink in Blue Thunder, and when I asked him, who drove Bulldozer, he simply replied, "Chuck", as if he was an old friend. Thank you Chris for bringing such joy to Gabriel and our family. You are a remarkable young man and we are blessed and privileged to know you at this time in Gabriel's life. As Gabriel's 2 year mark (May 1st) approached, Gabriel had a few battles with fever and viruses which required a couple trips to All Children's hospital. On May 26th, Gabriel's immune system counts went dangerously low to 80 (1000 is where the doctors want to try and keep his counts at). This required Gabriel to be placed in a quarantine status. The doctors stopped all chemo treatments and as the weeks went by, Gabriel began to rebound. As of this update, Gabriel is up to 75% strength of his chemo treatment. On June 29th, he will be evaluated again, if his counts continue to remain high enough, he will return to full strength chemo treatments. So as we continue to move forward, we live each day one day at a time. We thank God for the time He has given us to live, love and enjoy the time we have to share as a family. To learn the lessons of life together, and deal with the challenges that are before us. And at the same time, see the beautiful gift of life that Gabriel is to all of us. 11/9/2008 - Gabriel Continues His Maintenance Phase. Gabriel continues his maintenance phase of treatments and is in his 6th course of Treatments. He is doing very well over-all. He had a small bout with fever which set him back a few weeks due to his blood counts being too low to continue treatment. But after a couple weeks, his blood counts returned to an acceptable level and his medications were phased back in, first at 50%, then after a week, 75%, and then finally 100%. He is now back in full swing and doing great. He is full of energy and seems to be getting smarter every day. Sometime I forget he is only 5 years old. The way he tells his brothers and sister about visits to the hospital and the results of his blood tests is truly amazing. He takes great pride in telling everyone that his counts are good when we get a good report from the doctor. It is as if he knows exactly what he is talking about. I actually believe he knows a lot more than people give him credit for at his age. Gabriel's brother in-law, Lance joined the Air Force this past October and we were privileged to be able to attend his graduation. Gabriel had a really good time playing around all the planes and jets. He was especially enticed by all the airmen in their uniforms. The way they marched, saluted and all the precision in the way they moved and stood at attention. He actually began to imitate the airmen saluting and standing at attention including holding his arms at his sides and holding his hands tightly in a fist. He was also truly fascinated by the many different types of aircrafts. On display were a number of jets like the F-16, the SR-71, the C-130, and many others. He even sat up on the nose gun of the A-10A Thunderbolt. It was such a joy for us to be able to spend such an exciting weekend where Gabriel just had fun. We are beginning to prepare now for the holidays that will soon be upon us before we know it. This past year has been a year of trials, but at the same time, a year of great graces. Carol and I continue to pray daily for Gabriel's complete recovery and take much comfort knowing all of you are praying with us. I have posted Gabriel's Confirmation video, he is so cute. After the Bishop confirmed him, he shook the bishops hand, then turned and skipped away. It was truly priceless. I have also added a new series of photos from our trip to Lackland Air Force Base. There you can see all the fun Gabriel had. Well, that is all for now. Please continue to Keep Gabriel in your prayers and know that you are all in our family prayers too. 07/10/2008 - Gabriel Continues on Course 4 of Maintenance. Gabriel continues to do well as he progresses through course 4 of his maintenance treatments. Everyday I keep waiting for him to rebel against taking his medication everyday or going to the hospital, but he doesn't. He is so cooperative and does exactly what we ask him to do with such a spirit of trust and dependency. We can all learn so much from him. He is truly an amazing little warrior. Not too much has happened since my last update. Gabriel had a beautiful Confirmation and he did break his arm riding his bike in our yard. 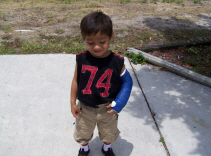 He fell and broke his arm in two places just above his left wrist. We took him to All Children's Hospital where they have a pediatric orthopedic center near by. He was so good as the doctor took X-rays, and then let him pick out a color for his cast. The doctor asked him if it hurt and Gabriel shook his head no. Then the doctor said "it will when I start to wrap the cast on". The PA showed him a series of colored samples and asked him to pick one. Of course he picked blue since blue is his favorite color. I think that's because blue is the color of one of his favorite monster trucks, "Blue Thunder". Gabriel had the cast on for four weeks and everything healed nicely. The doctor was actually surprised to find out Gabriel had leukemia because he looked so good and his bones healed so well. Once the cast was removed they did a bone density scan because his Oncology doctor told us the medication, Dexamethazone he is taking causes his bones to loose density and makes them more fragile. So he won't be riding his bike for awhile. On May 28th, Gabriel received the Sacrament of Confirmation. He looked so cute. I will post some video clips shortly. On our way to the Church, Gabriel wanted a toasted bagel from Dunkin Donuts with cream cheese. We told him that we would get him a bagel to celebrate his Confirmation after Mass was over. Well, just as the Bishop gave the final blessing, Gabriel looked at his sister and sponsor Maria and asked, "can I have a bagel now?". Gabriel took a few pictures and off we went to Dunkin Donuts to get him a toasted bagel with cream cheese. We all went back to our house and all celebrated this amazing gift Gabriel received in the awesome Sacrament. Punctuated of course with his bagel. I want to thank Bishop Lynch of the Diocese of St. Petersburg for his tremendous compassion in administering this Sacrament of Confirmation to Gabriel at his young age. With this added spiritual strength, I believe that Gabriel's chances of survival and beating this cancer has just been increased a thousand fold. That is about it for now, I will keep you all posted as we continue to journey forward with Gabriel. We have completed the first year of treatments and have 2 1/2 more to go. If you haven't done so yet, visit Gabriel's Gifts Galore at www.GabrielsGiftsGalore.com. It is an online store we have set-up to raise funds to help us with Gabriel's ongoing treatments. 04/24/2008 - Gabriel Begins Course 3 of Maintenance. Well, a lot has happened since my last update on Gabriel. He had a fabulous time at the Monster Jam event in Orlando, made possible by Chris Rossbach from Live Nation Motor Sports in Tampa, (Chris and Gabriel at right), his hair is growing back now, he has learned to ride a 2 wheel bicycle, and now he wants to tackle a pair of roller blades. He is truly an amazing little warrior. 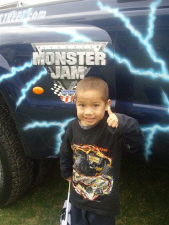 The Monster Jam event this past January has been the highlight of Gabriel's life. You would think it was just yesterday by the way he is so enthralled with his Monster Jam trucks, video games, World Finals DVD's etc... It has become something that allows him to take his mind off all that is going on around him with daily medications, stricked hygiene precautions and visits to the hospital for his chemo treatments. I placed a video up on his website of Gabriel going to the hospital dressed in his Monster Truck shirt, El Toro Loco hat and playing with his Monster Jam Trucks in the treatment room. Near the end of the video you will see him laying on the table clutching his Monster Trucks even during his treatments. It is a very cute 6 minute clip. There are some other new clips there as well. We are coming up on the one year mark of Gabriel's diagnoses with Leukemia (May 1st). It has been a very long and trying year for all of us and we thank God for our Faith and all your prayers and support. 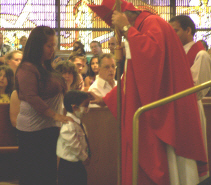 On May 28th, 2008, Gabriel will be receiving the Sacrament of Confirmation. Our local Bishop has extended this privilege to him to strengthen him and to aid him in this fight that he is in for his life. The Sacrament of Confirmation is called "The Sacrament of Battle" by the Church and for good reason. It gives us the spiritual strengthening we need to combat the evils of this world in all its forms. Please pray for Gabriel especially on the evening of May 28th and unite your prayers with him as this most holy Sacrament is bestowed upon him. This week, Gabriel began Course 3 of his maintenance treatments. Over the next 2 1/2 years, Gabriel will repeat the 12 week routine over and over until the 2 1/2 years are complete. He is really doing well and the doctors are very pleased with how Gabriel is responding and how good his spirits are. Looking at him, you would never know there was anything wrong. He plays, runs, rides his bike, wrestles with this brothers, plays soccer, swims and even jumps over ramps with his bicycle. And if you think that is something, you should see him on a skateboard. I promise I will get some more videos up of all this in the coming weeks and months ahead. We thank you once again for your much needed financial support, your never ending prayers and all the cards we have received. 2 1/2 years from now, I am confident you and I will look back at this period of time in our lives and together we will know, we fought this battle well along with Gabriel. I also know that God will not let our love, sacrifices, and prayers be in vain. Well, that is about it for now, I will post another update as we continue to journey forward with Gabriel. If you haven't done so yet, visit Gabriel's Gifts Galore at www.GabrielsGiftsGalore.com. It is an online store we have set-up to raise funds to help us with Gabriel's ongoing treatments. You can also follow Gabriel's progress at www.GabrielPSullivan.com. 01/28/2008 - Gabriel Begins Course 2 of Maintenance. -- Gabriel began Phase 5 Maintenance Course 2 this week and is doing very well. His spirits are always high and it seems that the worst part of the treatments are behind us. His Maintenance Phase will continue now for the remaining 2 1/2 years with a daily regiment of medications, but he handles taking his medications like a true warrior. Never a complaint or fuss and always looking ahead to when he is better. Many times he will say, "When I get better, I am going to play on a soccer team". He is such a strong little boy and tells us often that Jesus is going to make him better. I will continue to put up some new videos and photos since I know many of you are following Gabriel's progress regularly. We thank you for all your prayers, we know that it is the power of prayer that will see us all through this. If you have not yet checked out Gabriel's new website, www.gabrielsgiftsgalore.com make it a point to stop by and pass it on to your list of friends. 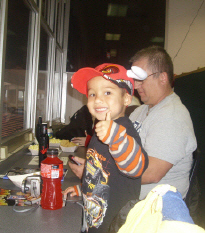 11/20/2007 - Gabriel Invited as Special Guest at Monster Truck JAM. -- Live Nation, the organization involved with the Monster JAM organization coming to Florida has invited Gabriel and his family to be their special guest at the Monster Truck Jam Rally in Orlando Florida January 26th. 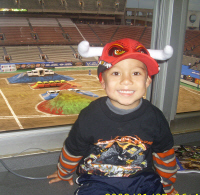 Gabriel has been a long time fan of the Monster Jam and the collection of Hot Wheels Monster Trucks. From the very first day Gabriel was diagnosed with Leukemia, the only thing that would calm him down and get his attention off the doctors poking him and nurses doing their hourly tests on him, was his monster trucks, his monster truck video and his monster truck Play Station video game. It was a phase I though would pass, but there is no sign of that in the near future. Recently when you ask him what's coming soon, you think he will say "Santa" or "Christmas", but he says "Monster Jam!" Then if you correct him and say, no Gabriel, Christmas is coming soon, he will tell you, "yea, but then it is Monster Jam." He is so cute. Gabriel turned 4 on August 6th and just wanted the Official Hot Wheels Monster Jam trucks for is birthday. He asked specifically for TAZ (Tasmanian Devil) and Blue Thunder, but I guess they are not out yet, but he keeps looking. Every week on our way home from All Childrens Hospital, he insists we stop at Walmart and see if they are in yet. He settles for some popcorn chicken only after a thorough walk through the Hot Wheels isle. I would have thought his love for the monster trucks would have passed as a phase but he really loves watching the videos and playing Monster Trucks. Every morning when Gabriel gets up, he brings me Outlaw and he gets Batman and my legs, arms, belly and feet all become jumps and obstacles. The arm of my chair has become Thunder Alley. He has created some amazing memories for me as his father. Ones I will cherish the rest of my life. 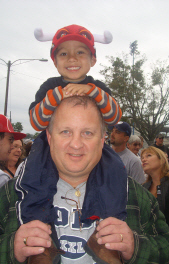 We are all so excited for Gabriel and I will post the pictures and videos of Gabriel at the Monster Jam in the Citrus Bowl in Orlando Florida once we return home January 27, 2008. If you have not yet checked out Gabriel's new website, make it a point to stop by.